16AWG, 3 outlet with child safety slide cover. Slim design grounded plug and outlet. Attach any power adapter to a power strip; wall outlet or uninterruptible power supply (UPS) without blocking other outlets. Provide space to fit oversized adaptors and allow atachments of multiple adaptors per outlet. 1 x NEMA 5-15R to 1 x NEMA 5-15P. Cable Type: SVT Rate up to 10A/125V. 16 AWG; UL/CSA listed. Length 1ft. Allows you to save space for multiple adapters per outlet. Perfect for power strips, wall outlets or uninterrupted power supplies without blocking other outlets. Free up outlet space by using this 1 ft extension cord to plug into power strips providing space for oversized adapters and multiple adaptor units. 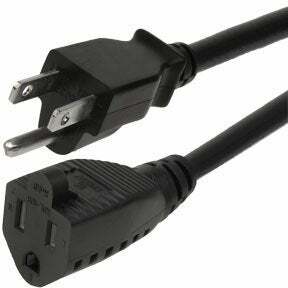 This extension cord has a right angle fitting to allow better use of your power supplies. Attach any power adapter to a 6-15p socket. Provide space to fit oversize adapters and allow extension of short cables. If you need extension power cords for any requirement at your home and office, you can now get them delivered at your doorsteps by ordering them online from SF Cable. Our range of extension power cords include power extension cord SPT-2, 3-outlet power extension cords, 12/3 SJTW heavy duty power cords, 16 AWG NEMA 5-15P to NEMA 5-15R Outlet Saver Power Extension Cords, 14 AWG C14 to C13 computer power extension cords, 16 AWG NEMA 5-15P to NEMA 5-15R Outlet Saver Power Extension Cords, etc. All cords are available in various lengths. All our products are RoHs certified and don’t cause any hazard to the environment. Safety and quality are our two ultimate goals along with providing competitive rates to our customers. You can also expect good after sales service and lifetime technical support on all our products.